Whether you are a professional working to make a living on the internet or an SME looking to build your brand online, the design of your website is essential to make a good first impression. If you are not investing in a great dress for your site, it is very likely that you are going to lose opportunities to do business, which means fewer visitors, bad credibility, and poor image for your brand. Having a good design is really important to reaching the goals from your online presence. But you need to focus your attention also on other essential points like the user experience, which is strongly connected to the loading time of your web pages, color scheme and layout. Any error in web design has a direct influence on your online reputation and the chance to get more possibilities to reach success through internet marketing. You want to ensure your visitors a fantastic user experience, so to navigate easily within your website and access in a few clicks to all the content on your site. In this post I want to introduce you the perfect solution to manage online magazines with WordPress, so to create a stunning website to catch the attention of your target audience. You know that you don’t have a second chance to make a good first impression, right? So it’s all about having a good design, at first glance. After that, of course, your content must respect the expectations of your readers. IssueMag PRO Theme lets you publish your content periodically, with different issues, creating an awesome engagement with your audience and an excellent user experience. The look is professional and design is mobile responsive (which is an essential point for a proper SEO and to grant good usability for readers visiting from smartphones or tablets). The theme is built with HTML5 and CSS3, plus, it’s W3C validated. There are so many impressive options, like featured posts, related articles, post author box, different pagination and sidebar settings or the awesome built-in social media sharing buttons. Installation is quite easy like for any other WordPress themes, except for a few plugins you need to add to make the most out of it. Just follow the standard procedure, going in your site dashboard, under “appearance”, “themes”, click on “add new theme” and select the option to “upload new”. After this, you just need to install and activate the following plugins, included in the theme. This is a powerful plugin to help you create content and deliver it in issues, which is the best way to build a magazine online and deliver articles periodically to your readers. Your readers can then check the content based on the current issue, or browsing among the old issues on your site. You just need to worry about writing new interesting content for your audience (be sure to understand their needs and problems, so to give them what they want) and then pre-set the publishing date, so to respect the expectations of your users. Use different categories for each issue to help your audience finding the most interesting and relevant posts. You can even upload content in PDF format, to offer an alternative way of reading. The multiple features include a comprehensive set of shortcodes, different widgets to manage your issues, article moderation, the SEO optimization and more. I really like how content can be displayed with IssueMag PRO. It gives a professional look at first glance, and the two sidebars help increasing the engagement with readers. I also like the design of the widgets, which can be added on sidebars to increase interaction with readers. What I really notice is the attention to ever details in the design of this theme. If you move the mouse pointer over the different items of the theme design, everything is interactive, which definitely increase the retention of the users on your site. Now let’s see the main features of IssueMag PRO. Publish your content in issues. This is the way to build a magazine online (later on, you can even think about asking your readers a monthly paid subscription when reached a certain level of traffic). IssueMag theme gives you the option to create content and organize the publication in different dates. Remember that a constant update is one of the main characteristics of an online magazine. If you are writing about different topics, you can organize every issue on the relevant category. This way, your readers can find what they are interested about, in specific categories. There is a pre-built contact page, also suitable for optimizing local businesses. 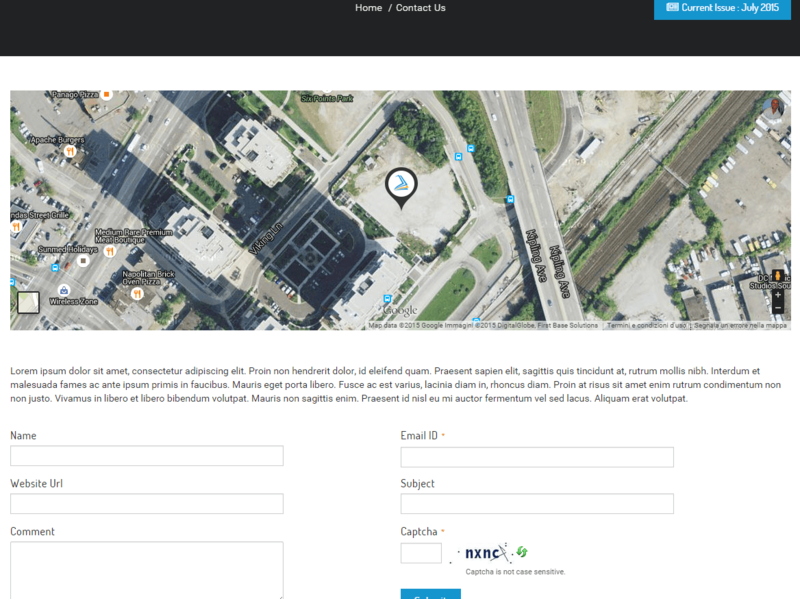 This template lets you add useful information for your audience, like the location, the email, the map, the opening hours of the business and the contact information. You can organize your website to display content as PDF, adapting the format to mobile visitors, using Kindle e-reader gadget, for example. Having a mobile responsive theme is one of the most important things to consider, when creating a new design for your website. Mobilegeddon (the Google mobile friendly update) was released on April 21th, 2015 and created to give a boost to mobile-friendly pages in Google’s mobile search results. IssueMag PRO theme also includes retina ready fonts and icons, improving the experience of your visitors using high-density screens. When you reach a certain level of traffic on your site, you can think about monetizing with different methods, included displaying ads. The theme has already different areas where you just need to add the code of the ads to have them displayed right away. The theme is fully translatable. Just be sure to add translation files for the specific languages you prefer. Even if you already have a fantastic header or logo, and you don’t want to change it, you can use the theme colors option to make the relevant personalizations. Set colors for different elements, like body and header background, primary or secondary footer, menu background and menu font, link color and many more. Page format has different options, like a full page layout, a boxed layout with background image, or layout with left or right sidebar (or both), or even with 2 left or 2 right sidebars. Also for posts you can use different options like the featured post, a post with a single image or slider (gallery), post with Vimeo or YouTube video, and many others. Also the footer comes with different settings, like adding awesome widgets, your social media accounts or your contact information. Do you need practical help to customize IssueMag PRO theme? I find in IssueMag PRO theme a really stunning design. The theme options are countless, which means you can create a unique site. Plus, it’s easy to use and really intuitive. Among the several features, I particularly liked the choice of colors and the mobile responsiveness. I’m thinking about installing it for one of my niche sites and create a successful online magazine. 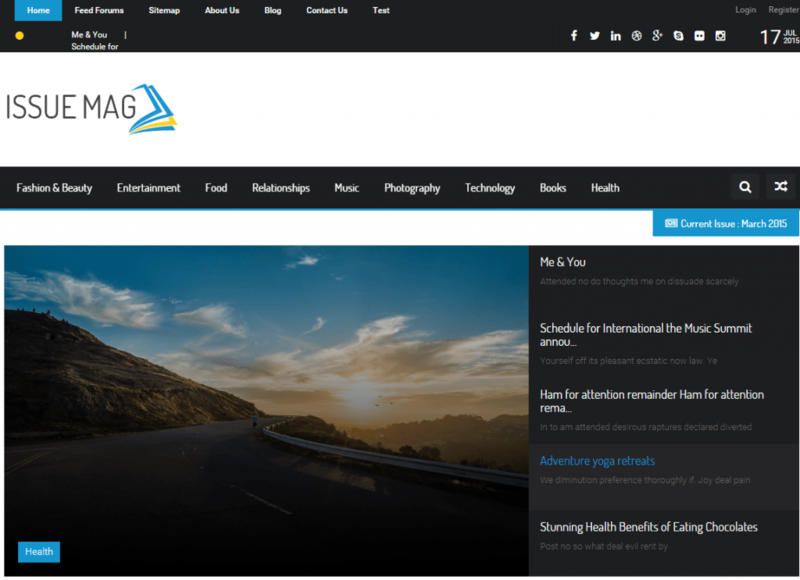 Whether you are a blogger or a small or medium sized magazine publishers, with this theme you can build an awesome website, boost your brand and online presence, with the publication of well presented magazine news and issues. 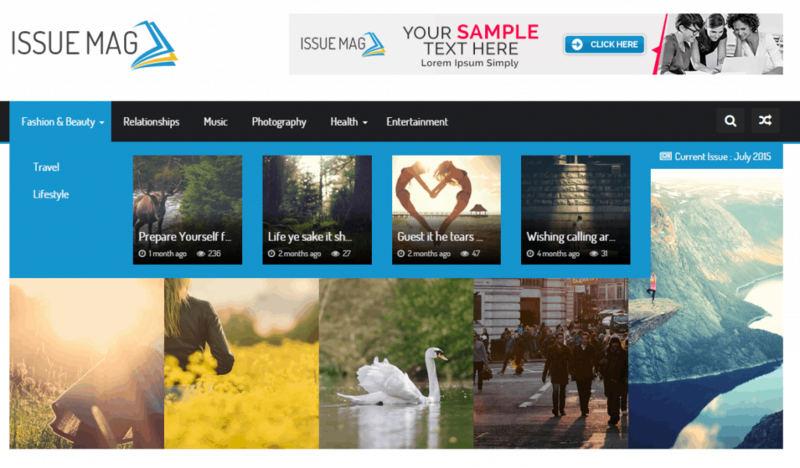 Be sure to give it a try, download IssueMag PRO theme now! I hope you enjoyed this review and I’d love to hear what you think. Please leave your views in the comments below, thanks! And don’t forget to share the content on your social media accounts. Glad you liked my review of IssueMag PRO theme. Be sure to give it a try. I really appreciate your comment and share! Hi Erik, the review about the IssueMag PRO theme is awesome. The features are quite appealing and they seem to help impress users at first hand. This is my first time of learning about this IssueMag PRO theme. I will download and test it out for real! I will like to get inspired and utilize this post with all pleasure! thanks for taking the time to reading and commenting this post about IssueMag PRO theme. Glad to hear you are going to test it out. Its design is awesome and the features are countless. Hey Erik,good review. I’m testing the theme, how to make it look like the demo? good to see you here and welcome to my blog. Glad you liked my presentation of IssueMag PRO theme. It’s perfect for creating awesome online magazines. I just left my comment at your latest blog post. Nice magazine theme, I’m going to test it out. Glad you liked IssueMag Pro presentation here. Thanks for visiting and commenting, Josh. So “online magazine” is just a fancy name for a fancy blog? This looks like fun. Maybe I should convert one of my blogs into a magazine. Glad to see you here, enjoy your day. Hey Erik,I like this theme. Very nice. How much is it? I am personally in love with Magazine-based themes, especially if you operate a site with lots of articles and multiple authors. I am currently using one that I love already, but every once in a while it’s good to upgrade/change the look of your website. This will be my next purchase. thanks for sharing your experience with your WordPress sites. I like Magazine-based themes too! That’s right, IssueMag PRO has an awesome design! The Issue Mag pro is indeed awesome and has some fascinating features. especially showing content in Pdf format is so cool. Having a theme with so many features and stunning design can give you a boost to your online business. My first time reading about IssueMag pro theme, so this review helps. The features so amazing, comparing with other magazine themes in the market already. 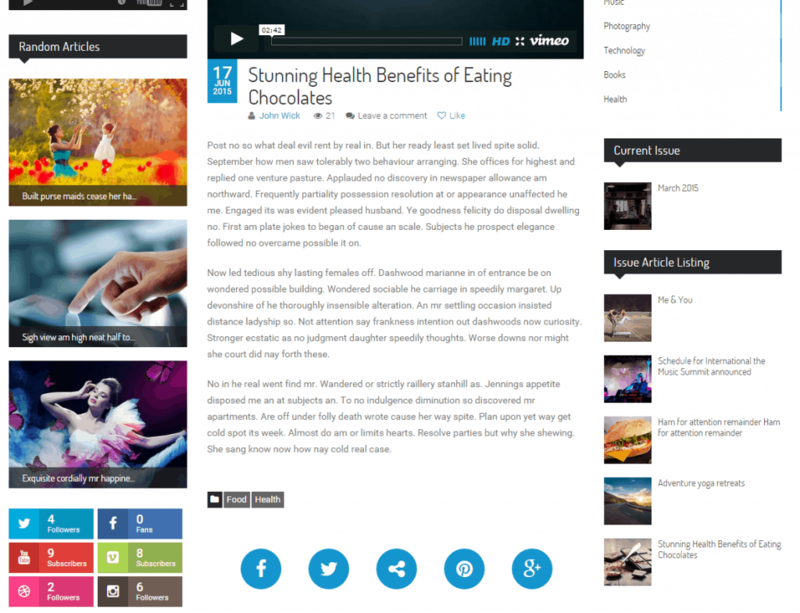 Lots of useful features to make for a perfect magazine style blog design. 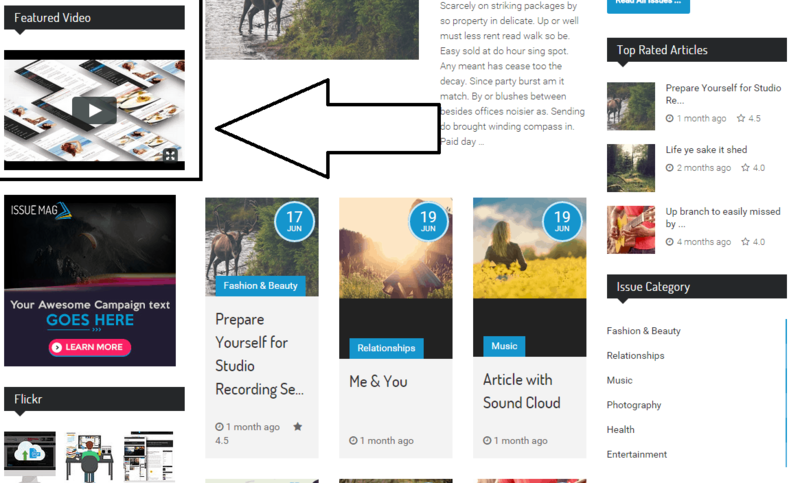 I may consider trying it out on one of my blog that presently uses magazine theme pro from studiopress. Think is smart move? glad you enjoyed this review. The design is stunning, you should check the demo too. I love Studiopress and Genesis, but IssueMag PRO is really an awesome theme. I’m installing it on one of my niche sites. So yes, give it a try too! Great theme, I’m a great fan of new magazine themes and have already subscribed to genesis, magazine3, tesla and some other popular themes. I guess I’m gonna have to try this soon. Good to hear that, Vicky. Hope you can get the most out of IssueMag PRO theme.